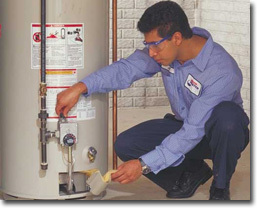 At Roto-Rooter, we offer water heater repair services to rehabilitate residential water heaters across California. We have years of experience working with these systems and ensuring that our repairs are effective and non-destructive. We have the best tools and equipment to address all of our customer’s needs. If the water heater is leaking, this may be due to a crack in the internal tank, which may require the water heater to be replaced in order to prevent any further water damage on residential properties. A noisy water heater could be a result of several different problems. A low rumbling sound indicates that sediments may have begun to collect and could be solidified at the bottom of the tank. This means the water heater is beginning to lose its efficiency. As this sediment builds up, more and more heat is lost and will result in cold showers. If left untreated, the overheating of the bottom portion of the tank could shorten the lifespan of the tank. It is possible to have a technician flush the tank, but if the sediment has already solidified, then the water heater might need to be replaced. If the water heater is producing a high pitched sound, it could be the result of a high incoming pressure. This means the valve that helps regulates the water pressure could be failing. This is a problem that needs to be addressed quickly, generally by repairing the valve. If the tank is over pressurized for an extended period of time, it could lead to cracks, leaks, and even a burst tank. If there is no hot water being produced from the faucets, the cause can depend on what kind of water heater the homeowner owns. A gas heater that doesn’t produce hot water could mean that the pilot light could be out or there is a malfunctioning part. Having one of our technicians come to the home can help identify which problem is causing the lack of hot water. If this is occurring with electric water heaters, the problem could lay with a tripped breaker or a failing thermostat. If the hot water smells similar to rotten eggs, this could be a result of bacteria in the water. The tank can be flushed and then filled with hydrogen peroxide and water that is allowed to sit for two hours. If both hot and cold water is odorous, it is possible that the problem does not lie in the water heater. While the reasons for why the hot water heater could be inoperational can be dependent on many different things, our California customers can rest easy when they call our team of professionals for assistance. Our technicians at Roto-Rooter can help identify which issue is causing the lack of hot water and then they can address it appropriately. If you’d like to speak to a professional about the water heater symptoms you may be encountering, please give us a call at (805) 620-3700!